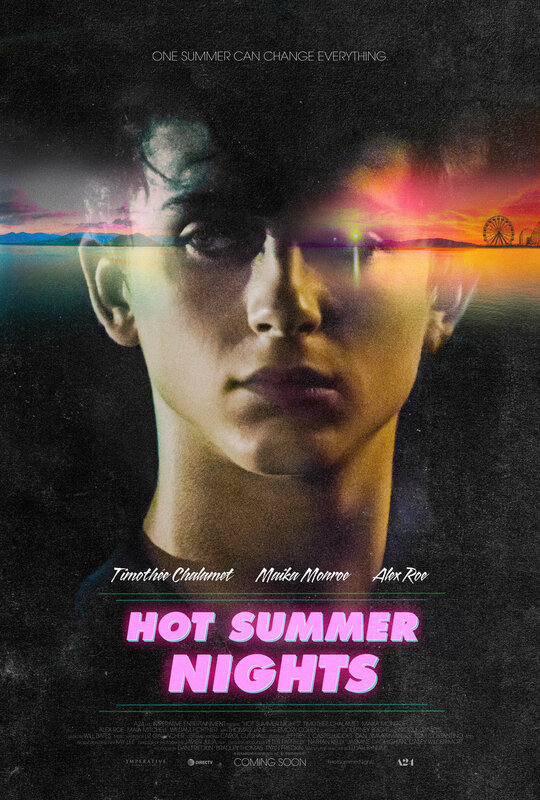 A24 reveals the first trailer and poster for their next awesome film, the new coming of age tale, Hot Summer Nights, starring Timothée Chalamet and Maika Monroe. Set in Cape Cod over one scorching summer, Hot Summer Nights follows Daniel (Chalamet), a shy out-of-towner who gets in over his head flipping weed with the neighborhood rebel (Roe) while pursuing his new business partner’s enigmatic sister (Monroe). With a hurricane looming in the wings, tensions rise against a backdrop of drive-ins, arcades, and crashed parties as the stakes (and temperatures) grow ever higher. Written and directed by Elijah Bynum, Hot Summer Nights will be available exclusively on DIRECTV June 28 and in theaters July 27th. Looks pretty damn sweet! What do you guys think about the trailer? Will A24's hotstreak ever end? Let us know your thoughts in the comments below. Oh! We've also got a cool poster for the film below.